Katy says: I’m going to follow up on Quico’s post and work through the second of the four scenarios: the possibility that opposition candidate Manuel Rosales does not concede victory, and declares massive fraud. As should be obvious, a move like this can go wrong in many different ways (ask Andres Manuel Lopez Obrador, or closer to home, Enrique Mendoza). Nobody likes a sore loser, so if you’re going to declare the election null and demand radical action, you better have the goods to back it. That means, roughly put, that Rosales has to have the votes, the chads, the crooks and the musiús aligned. International observers side with your concerns. 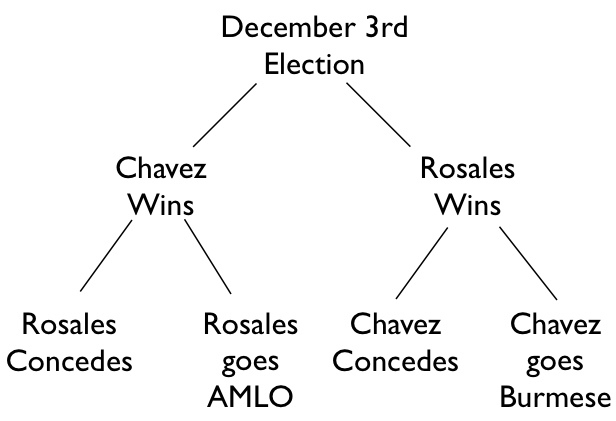 Even if these conditions are met, going AMLO is still a risky proposition. But if you don’t have your ducks lined up in a row, it would be a disaster.